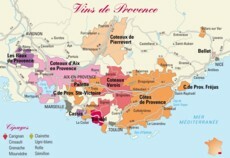 Provence’s vineyards cover four ‘departments’. Eight AOC areas expressing the idiosyncrasies of its diverse terrain. Based around Saint-Rémy-de-Provence, the area’s winegrowers are adopting a collective approach focusing on biodynamic viticulture. The wines differ depending on which side of the Baux valley, north or south. Sliced in two by the Coteaux-Varois region, it stretches from Trets to Saint-Raphaël. Rosés make up 60 % of production. 1700 hectares north of Toulon, sheltered by the Sainte-Baume hills. Around the river Durance and the town of Forcalquier. Bandol’s speciality is reds thanks to the Mourvèdre grape variety, capable of producing age-worthy wines after 18 months ‘softening up’ in large oak casks. Commanderie de Peyrassol in Flassans sur Issole.